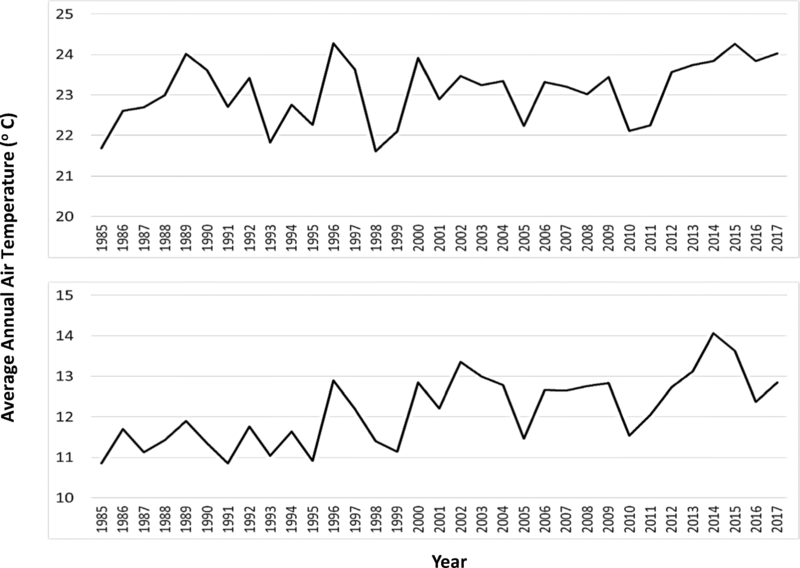 In the deserts of Southern California, air temperatures have been rising and precipitation variability has been increasing over the past several decades. These recent climate shifts may have begun to threaten the survival of certain plant and animal species in these arid ecosystems. This study was designed to quantify and characterize variations in vegetation canopy density using more than 30 consecutive years of Landsat satellite image data across the western Lower Colorado (Sonoran) and southern Mojave Desert region. Mapping of the normalized difference vegetation index (NDVI) from Landsat images (1985 to 2017), which has been closely correlated with percent cover measurements of green vegetation canopies in a variety of arid ecosystems, was used to detect periodic upslope and downslope shifts in plant cover. The change in Landsat NDVI between 1985 and 2017 within the Santa Rosa Mountains Wilderness at four elevation zones between 500 m and 2500 m showed that vegetation green cover dropped notably in below-average precipitation periods, whereas green cover increased sharply in above-average precipitation years. This same temporal pattern of shifting in NDVI was detected along steep elevation gradients in the Anza-Borrego Desert State Park and in the Little San Bernardino Mountains of Joshua Tree National Park. Although the distribution of the dominant plant species along elevation gradients may have increased by more than 60 m over several decades (prior to 2007), we found no evidence that upslope shifts in percent plant cover have yet become a permanent pattern at these mountainous desert sites. Recent changes in plant species distribution have been reported in response to climate change in terrestrial ecosystems worldwide, including species shifts up or down in elevation with localized variations in precipitation and air temperature [1, 4, 5, 6, 7, 12, 18]. Climate model predictions for the Mojave and Lower Colorado Desert regions of North America were summarized by Bachelet et al. to infer that extreme heat and drought caused by recent climate shifts may have already exceeded the survival thresholds of some plant and animal species in Southern California deserts. Adiabatic climate gradients can have a pronounced effect on vegetation community composition in Mojave Desert mountain ecosystems . Higher elevations receive more precipitation during summer convective storms, as well as night-time temperature inversions. 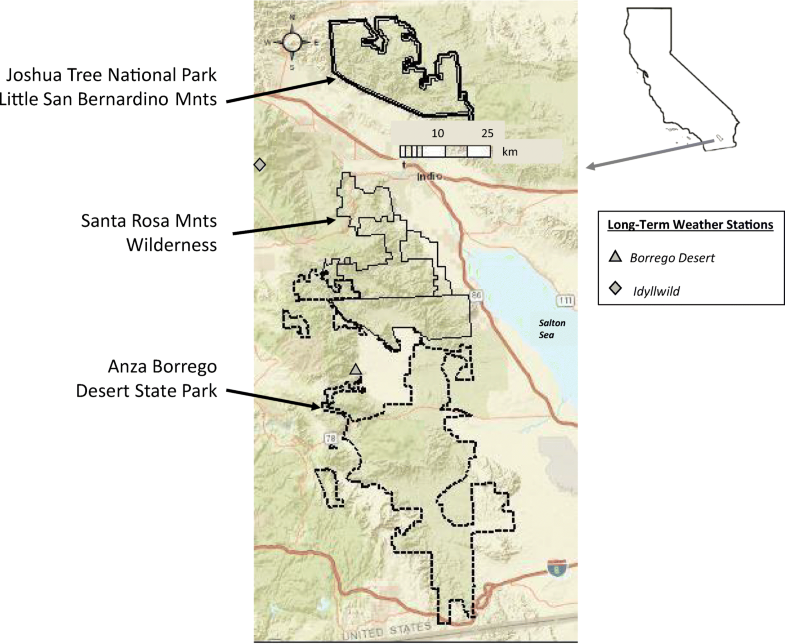 These climate-elevation transitions may create a stark gradation between relatively high elevation woodland communities and lower elevation creosote shrubland communities in the Mojave Desert . Studies of ecosystems in the Santa Rosa Mountains of Southern California spanning 30 years by Kelly and Goulden  discerned that regional air temperatures have been rising and precipitation variability has been increasing (including declines in annual snowpack) over an elevation gradient of 2300 m. These authors related plant mortality events to two extreme droughts recorded between 1977 and 2007 and further documented the upslope movement of the dominant shrub and tree species by approximately 65-m vertical distance. These relatively rapid upslope shifts in plant cover were linked to an observed increase in precipitation variability, lower proportion of precipitation falling as snow, and surface warming. It was deduced that plant species redistribution along this arid mountain gradient occurred episodically, with accelerated mortality in the lower elevations of all species ranges during relatively dry periods (e.g., 1999–2002) and infilling across all species ranges during relatively wet periods (e.g., 1993–1995 and 2005). The vast expanse of the Sonoran and Mojave Deserts with its extremely rugged topography make studies such as those of Kelly and Goulden  difficult to replicate and then to extend into future years. Satellite remote sensing can be used to fill this gap in vegetation change monitoring for these expansive arid regions. 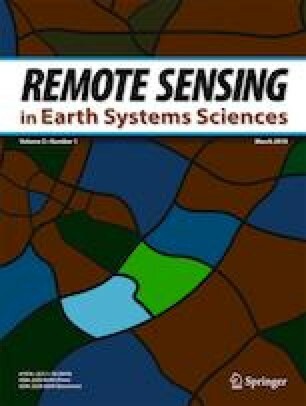 Accordingly, the objective of this study was to quantify and characterize variations in desert vegetation canopy density across elevation gradients using more than 30 consecutive years of Landsat satellite image data across the western Lower Colorado and southern Mojave Desert region. The Santa Rosa Mountains vegetation gradient studied by Kelly and Goulden  is unique in the western USA for field data on long-term elevation shifts in plant cover, and combined with other state and federal protected areas in the southern Mojave, a valuable comparative study design at a regional scale has been developed for this satellite image analysis of recent vegetation cover change. The normalized difference vegetation index (NDVI) from Landsat has been closely correlated with percent cover measurements of green vegetation canopies in arid ecosystems, as reported in numerous published studies ([2, 26, 28]; ; ; ; [14, 15, 27]). More specifically, Ramsey et al. found that NDVI from Landsat was closely correlated (r = 0.88; p < 0.05) with total percent cover of live vegetation in a semi-arid sage-brush ecosystem in south-central Utah. Montandon and Small  reported similar results for NDVI correlations with fractional cover in creosote-dominated shrubland sites of New Mexico. The NDVI was selected over other available satellite green cover indices for change detection, such as the enhanced vegetation index (EVI), since it has been documented that EVI would be more appropriate for regions where vegetation cover is denser and greener because NDVI tends to have a strong non-linear response over low-to-moderate greenness cover (as found in deserts), whereas EVI remains linearly responsive in those environments . Three protected areas spanning a gradient from the southern Mojave Desert to the Lower Colorado Desert eco-climatic zones were selected for an expanded regional analysis of directional shifts in vegetation cover with elevation, as generally postulated by Kelly and Goulden . At equivalent elevation zones, these three study areas represented a gradient of steadily increasing annual temperature stress, moving from north to south, for the study of vegetation cover of Southern California deserts in response to recent climate variations. Since the areas were all protected by state or federal designations for the past several decades, any disturbances of vegetation cover would not be attributable directly to human development or extractive activities. The Santa Rosa Mountains Wilderness is located in the Peninsular Range system, east of the Los Angeles Basin in Southern California (Fig. 1). Dominant plant species, listed from high elevations of 2400 m to lower elevations of around 500 m by Kelly and Goulden , include the evergreen trees Abies concolor (white fir), Pinus jeffreyi (Jeffrey pine), Quercus chrysolepis (canyon live oak), and the shrubs Rhus ovata (sugar bush), Ceanothus greggii var. perplexans, Quercus cornelius-mulleri (Muller oak), Larrea tridentate (creosote bush), Ambrosia dumosa (white bursage), and Agave deserti. Annual precipitation at 300-m elevation (Boyd Deep Canyon station, 33° 39′ N, 116° 23′ W) has averaged 97 mm over the past decade (ranging from 56 to 130 mm year−1), with mean monthly air temperatures from winter to summer ranging from 14.7 to 33.4 °C. At 1240-m elevation (Pinyon station, 33° 34′ N, 116° 27′ W), annual precipitation has averaged 264 mm over the past decade (ranging from 150 to 513 mm year−1), with mean monthly air temperatures from winter to summer ranging from 7.4 to 27.4 °C. The Anza-Borrego Desert State Park is located just to the southwest of the Santa Rosa Mountains in the Lower Colorado Desert. Dominant plant species, listed from high elevations of 1800 m to lower elevations of around 100 m by Lightner , include the evergreen trees Pinus monophylla (Pinyon pine), Juniperus californica (California juniper), Chilopsis linearis ssp. arcuate (desert willow), Cercidium floridum (Blue Palo Verde), and the shrubs Larrea tridentate (creosote bush), Prosopis sp. (mesquite), Senegalia greggii (catclaw), and Agave deserti. Annual precipitation at 246-m elevation (Borrego Desert Park station) has averaged 135 mm over the past 25 years (ranging from 21 to 357 mm year−1), with mean monthly air temperatures from winter to summer ranging from 13.7 to 35.5 °C. The Little San Bernardino Mountains of Joshua Tree National Park are located in the Transverse Range of the southern Mojave Desert across San Bernardino and Riverside counties. Dominant plant species, listed from high elevations of 1700 m to lower elevations of around 500 m by La Doux et al. , include the evergreen trees Pinus monophylla (Pinyon pine), Juniperus californica (California juniper), Quercus cornelius-mulleri, and the shrubs Coleogyne ramosissima (black bush), Larrea tridentate (creosote bush), Ambrosia dumosa (white bursage), and Senegalia greggii (catclaw). Annual precipitation at 1280-m elevation (Lost Horse station, 34° 01′ N, 116° 11′ W) has averaged 148 mm over the past 25 years (ranging from 22 to 493 mm year−1), with mean monthly air temperatures from winter to summer ranging from 6.2 to 26.5 °C. According to the satellite image record of wildfires mapped by Landsat since the year 1984 from the Monitoring Trends in Burn Severity project (www.mtbs.gov; ), only two small fires, together totaling less than 1620 ha (4000 acres), have been documented for the study areas, namely the 2006 Pushwalla and Whispering Pines Fires in Joshua Tree National Park. The total area burned in these fires was insignificant (less than 3%) compared with the total area of any of the three study areas. Two weather station locations, at Borrego Desert Park (33° 15′ N, 116° 24′ W; 246-m elevation) and Idyllwild (33° 45′ N, 116° 43′ W; 1640-m elevation), were used for long-term (30 years) comparisons to variations in Landsat greenness data since 1985. Monthly precipitation totals and average annual air temperature records from 1985 to 2017 were downloaded for both weather stations for analysis and comparisons. Cloud-free imagery from Landsat sensors was selected from the US Geological Survey (USGS) EarthExplorer data portal (available online at earthexplorer.usgs.gov) for every year from 1985 to 2017. Landsat scenes from path/row 39/37 were acquired between April 1 and May 30 each year, around the peak flowering period in the Lower Colorado Desert growing season , but after the main rainfall periods of each year, and at a time when most annual herbaceous species have died back. The satellite image data therefore represented the total percent cover by perennial plants . All images used in this study were geometrically registered (UTM Zone 10) using terrain correction algorithms (Level 1T) applied by the USGS EROS Data Center. For the Landsat 4–5 Thematic Mapper (TM) images acquired between 1985 and 2011, 30-m resolution surface reflectance data were generated from the Landsat Ecosystem Disturbance Adaptive Processing System . Moderate Resolution Imaging Spectroradiometer (MODIS) atmospheric correction routines were applied to Level 1 TM data products. Water vapor, ozone, geopotential height, aerosol optical thickness, and digital elevation are input with Landsat data to the Second Simulation of a Satellite Signal in the Solar Spectrum (6S) radiative transfer models to generate top of atmosphere (TOA) reflectance, surface reflectance, brightness temperature, and masks for clouds, cloud shadows, adjacent clouds, land, snow, ice, and water. Landsat 8 (after 2012) surface reflectance products were generated from the L8SR algorithm, a method that uses the scene center for the sun angle calculation and then hard codes the view zenith angle to 0. The solar zenith and view zenith angles are used for calculations as part of the atmospheric correction. where Red is the reflectance band from 0.63 to 0.69 μm and NIR is the near-infrared reflectance band from 0.77 to 0.90 μm . NDVI was scaled by the USGS EarthExplorer source from 0 to 10,000, with low values of (near 0) indicating barren land cover and high values of NDVI (above 7000) indicating dense canopy vegetation cover . Within each of the three study areas shown in Fig. 1, 5000 points were randomly selected for extraction and plotting of yearly Landsat NDVI trends, spanning all elevation zones randomly and consistently and separated by a minimum distance of 30 m. Using the random number generator and seed function in ArcGIS version 10.3, a random value on the x-axis and another on the y-axis of the extent were identified, which become the x and y coordinates for a point. To randomly select the point on the x-axis, the next unused value on the random number stream is selected and transformed into a uniform distribution with a minimum and maximum being the minimum and maximum for the x extent. The same is done for the y-axis. This process is repeated until the specified number of sample points (5000) was reached. The same 5000 points per study were consistently sampled from within every Landsat image area. Non-linear regression by third-order polynomial  was used to test for significant time series trends and correlation relationships between NDVI and elevation within each study area. Tests of statistical significance between years of NDVI were carried out using the two-sample Kolmogorov-Smirnov (K-S) test, a non-parametric method that compares the cumulative distributions of two data sets . The K-S difference test does not assume that data were sampled from Gaussian distributions (nor any other defined distributions), nor can its results be affected by changing data ranks or by numerical (e.g., logarithm) transformations. The K-S test reports the maximum difference between the two cumulative distributions and calculates a probability (p) value from that difference and the group sample sizes. It tests the null hypothesis that both groups were sampled from populations with identical distributions according to different medians, variances, or outliers. If the K-S p value is small (i.e., < 0.05), it can be concluded that the two groups were sampled from populations with significantly different distributions. Comparisons of water-year (WY, October to September) precipitation totals among long-term climate station records across the study areas showed that the years 1993, 1998, 2005, 2010, and 2017 were all above-average precipitation periods (Fig. 2). Each of these WYs totaled between 20 and 90% higher precipitation than the long-term WY average. The WYs of 1996, 2002, 2007, and 2014–2016 were all below-average precipitation periods across the study areas, commonly with 60% lower precipitation than the long-term WY average. Trends in average annual air temperature records showed a significant warming pattern (p < 0.01, R2 = 0.5 with time) in the 30-year climate record at both the Borrego Desert Park and the Idyllwild stations (Fig. 3). All the other weather stations in the study area region have shorter air temperature records, commonly of less than 20 years, and therefore could not be used for analysis of long-term warming trends. The change in Landsat NDVI between 1985 and 2017 within the Santa Rosa Mountains Wilderness at four elevation zones between 500 m and 2500 m showed that vegetation green cover dropped notably in below-average precipitation periods of 2002, 2007, and 2014–2016, whereas green cover increased sharply in the above-average precipitation years of 1998, 2005, 2010, and 2017 (Fig. 4). The lowest NDVI over the past 30 years was observed in 2016 at all elevation zones, following four consecutive years of below-average precipitation (as shown in Fig. 2). 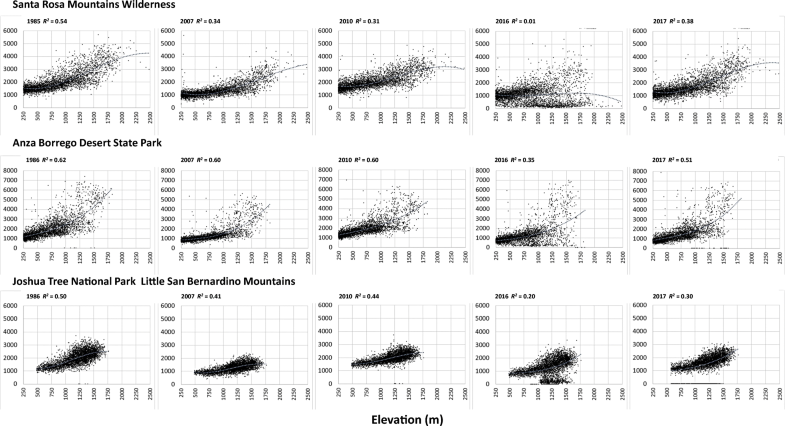 Superimposing the relative change measured in total percent cover of perennial plants by Kelly and Goulden  along the Deep Canyon Transect of the Santa Rosa Mountains in 1977 and in 2006–2007 on each of these (elevation zone) NDVI time series plots in Fig. 4 revealed a consistency of findings, namely that vegetation cover declined due to higher plant mortality in the lower elevation parts of all species ranges during anomalously dry periods, whereas regrowth and infilling of live plant cover occurred across all species ranges during anomalously wet periods. Comparison of NDVI change with increasing elevation across each of the three study areas (shown in Fig. 1) extracted for five different years (Fig. 5)—1985/1986 (wet), 2007 (dry), 2010 (wet), 2016 (dry), and 2017 (wet)—showed a consistent damping during anomalously dry periods of the strong upward correlations in vegetation green cover (as NDVI) with increasing elevation. The non-linear correlations (with R2 > 0.4) computed between NDVI and elevation were significant at p < 0.01 in all years, with the exception of 2016, which was not significant for the Santa Rosa Mountains Wilderness area and was markedly weaker in 2016 across the other two study area elevation gradients. The Landsat NDVI change with elevation for the Santa Rosa Mountains Wilderness area (Fig. 5) showed the same patterns as the total percent cover of perennial plants measured by Kelly and Goulden  in 1977 and in 2006–2007, specifically a steady increase in green vegetation cover to approximately 1750-m elevation, and then a leveling-off of green plant cover to 2500-m elevation. These NDVI gradient results across the three study sites were all consistent, with lower plant cover measured in 2006–2007 below 2000-m elevation, but was observed to recover strongly during relatively wet years of 2010 and 2017 to the highest green vegetation cover measured since the mid-1980s by Landsat NDVI across the elevation gradients. The non-parametric K-S test results showed that NDVI elevation gradient patterns from 2007 (Fig. 5) were significantly lower (p < 0.01) than either 1985/1986, 2010, or 2017 NDVI gradient patterns at all three study areas and NDVI elevation gradient patterns from 2010 (Fig. 5) were significantly higher (p < 0.01) than 1985/1986 NDVI patterns, suggesting a complete recovery of percent plant cover from the effects of the 2007 low precipitation period. Moreover, there were significant decreases in NDVI throughout each of the three elevation gradients in 2016 compared even with the depressed 2007 NDVI gradients (K-S test p < 0.01). The NDVI mean and standard deviation for all Landsat pixels within the three study areas were computed for three key years, 1985, 2007, and 2010, which represented the start period, the middle (severe drought) period, and the recent (near average precipitation) period of the time series. These summary statistics showed that mean NDVI decreased by 24% in the Santa Rosa Mountains Wilderness and by more than 32% in the other two study areas between 1985 and 2007 (Table 1). Between 2007 and 2010, mean NDVI increased again by 31% in the Santa Rosa Mountains Wilderness and by more than 50% in the other two study areas. Variation in NDVI over the areas indicated by the standard deviations levels was highly consistent over the 3 years for the Santa Rosa Mountains Wilderness area, but variations in NDVI decreased notably from 1985 to the more recent years for the other two study areas. Linear least-square regressions of long-term (1985 to 2017) annual (average) temperature and (total) precipitation data values from the Borrego Desert Park and the Idyllwild weather stations (Figs. 2 and 3) resulted in significant (p < 0.01) correlations at elevations less than 1000 m with NDVI (Fig. 4) in the Santa Rosa Mountains Wilderness, returning R2 correlation coefficients all greater than 0.3. The correlations with average temperature were all negative (decreasing NDVI with warming), and the correlations with precipitation were all positive (increasing NDVI with higher rainfall totals) across these 30+ years. At elevations higher than 1000 m, long-term temperature and precipitation R2 correlation coefficients with NDVI were all lower than 0.25. Three decades of Landsat NDVI analysis generally support the findings of Kelly and Goulden  that surface temperature warming and the occurrence of severe drought periods increase vegetation stress and perennial plant mortality in desert ecosystems of Southern California. However, the updated (to 2017) satellite data indicated that these changes in live green tree and shrub cover have not been irreversible. Relatively wet years like 2010 and 2017 allowed a complete recovery and infilling of perennial plant cover, as measured by NDVI, even after four consecutive years of below-average precipitation. Although the measured distribution of the dominant plant species on the Deep Canyon elevation gradient increased by 65 m over 30 years (1977–2007), no evidence was found that this upslope shift in percent plant cover would be a permanent change. A high(er) frequency of severe drought periods in future decades could however lead to profound structural changes in upslope plant communities, such as lower average leaf area, over the long term. In spite of consistent temperature warming trends since the late 1970s in these California desert landscapes , it is probable that a corrective downslope shift in plant (re)growth can be explained by dominant species tracking of changes in climatic water balance, rather than solely in response to surface temperature changes, as documented by Crimmins et al. . Downslope shifts in vegetation cover density can be expected to occur in regions where future increases in precipitation and soil water availability will outpace evaporative demand, at least periodically. Based on the remote sensing results we presented, even vegetation decline during several consecutive years of warming and drought can be offset with infilling and regrowth during a single year of anomalously high rainfall in the Mojave and Lower Colorado deserts. 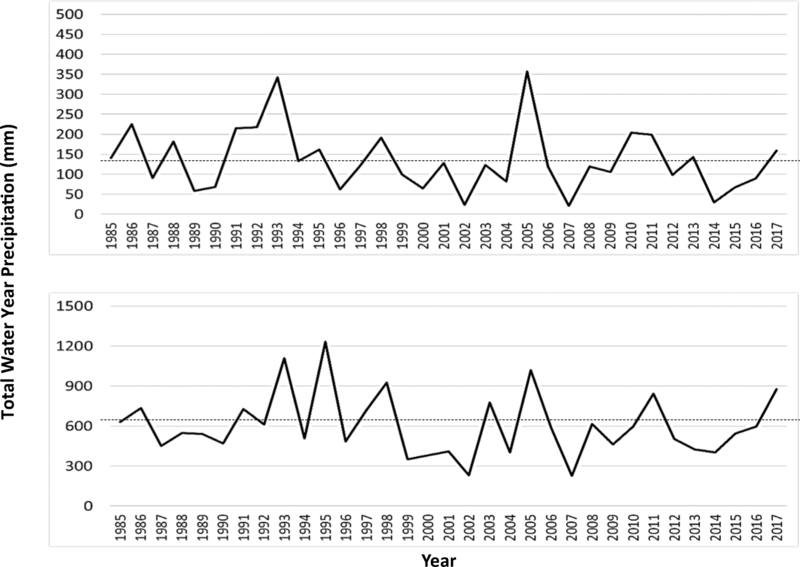 Although localized elevation shifts in dominant desert plant species cover and mortality seem to be cyclical on less than decadal time periods, regional-scale patterns of long-term (50 to 100 years) climate change for the southwestern portion of North America will likely have a major impact on migration of plant associations from the Sonoran and Mojave deserts into surrounding bioclimatic zones. In general, climate models predict that summer temperatures and aridity will increase widely in the southwestern USA and at lower elevations throughout the Interior West . Winter season temperatures are projected to increase by 2 to 9 °C. Friggens et al. summarized recent modeling predictions and asserted that climate change projections through the year 2060 will be favorable for scrub vegetation types of the Mojave Desert (85% increase) and Sonoran Desert (79% increase) to expand northward into the Great Basin and Snake and Columbia River Plains. Shafer et al. used bioclimate modeling to predict expansions of Joshua tree (Yucca brevifolia), and creosote bush, which were projected to migrate northward into Great Basin areas currently occupied by sagebrush (Artemisia tridentata). Moreover, the distribution of certain prominent Mojave Desert plant species is influenced strongly by the extent and amount of summer rainfall. Many species of cacti, yuccas, agaves, and agave-like plants increase in number where summer rainfall is relatively abundant . Summer rainfall may increase the probability of establishment of some species such as creosote bush that germinate under warm conditions . Leguminous trees, such as Palo Verde (Cercidium microphyllum), are dependent on reliable summer rainfall and are present only in the southeastern Mojave and Lower Colorado deserts. Other yuccas, such as the Joshua tree, are generally more abundant in areas dominated by winter precipitation. Therefore, understanding the changes in seasonality of precipitation in the desert southwest region is a key to predicting future shifts in dominant plant species distributions. It should be noted in conclusion that precipitation variability modifies desert ecosystem processes in many ways, which in turn has implications for land management decisions and the recovery rates of plant species from human disturbances. The increasingly complex interaction of drought, introduced invasive grasses, and wildfire with changing rainfall patterns will be among the most vexing problems facing native species conservation efforts in the Mojave and Sonoran Desert regions in the years to come . This research was funded by the US Department of the Interior Bureau of Land Management (BLM).